The following METAR placefiles were developed from the ground up with operational meteorology and storm chasing in mind. 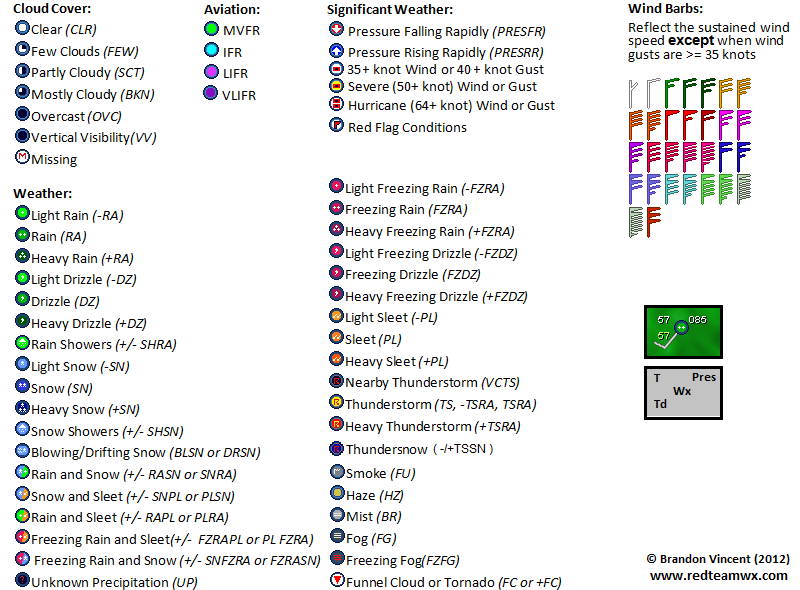 These placefiles are unique for many reasons, such as plotting weather conditions, wind speed/direction and peak wind gusts using custom designed icons and an experience-based METAR decoding logic that highlights significant weather in a highly intuitive and user-friendly manner. Click HERE for a legend. To use the following dynamic placefiles, simply copy the link and then paste it into the placefile manager in GRLevelX. There is no guarantee that the placefiles will always be available or that the data displayed will always be up-to-date and/or correct. These placefiles are in continual development and thus are subject to change at any time. NOTE: LOOPING PLACEFILES REQUIRE GR2Analyst (v2.60 Beta3 OR HIGHER). Tip: Load any single variable (T, Td, Tw, WC, Tdd, etc.) with the Wind Barb Plot to produce novel combinations useful in analyzing a wide variety of hazardous weather environments. The CONUS Rivers and Lakes zip archive contains all of the files (.shp .dbf .shx .sty) necessary for plotting rivers and lakes across the Continental US. To load in GRLevelX, click on GIS->LOAD SHAPEFILE and then select the conus_rivers_lakes .shp and .sty files from the appropriate directory (where you unzipped conus_rivers_lakes.zip. Tip: Load the AHPS river gauge placefile with the CONUS rivers and lakes shapefile for a better understanding of the hydrology in your area. Incredibly accurate and extremely detailed road shapefiles for GRLevelX. They even display dirt roads! Storm chasers, these are a must have, especially when using GPS with GRLevelX. Disclaimer: Always keep alternative routes in mind, especially when travelling on dirt roads. Red Team found this out the hard way when a dirt-road escape route turned into a dead-end, leaving us uncomfortably exposed as a nasty supercell bared down on our position, a flat, featureless, barren location in central TX. "But.. it was on the map? Tough ! @#$, think fast!" These took a lot of work, i.e. downloading road shapefiles for every county of every state and compiling them into discrete state-based files. If you prefer to avoid the tedious nightmare of county-based shapefiles, download the zip file for the state(s) listed below, then unzip the contents into a folder (preferably your GRLevelX folder) and then add the .SHP file and .STY file via the GIS/Load Shapefile menu in GRLevelX.